Lake Waikaremoana bridge had a “robust and comprehensive” asset management system. By NZ standards. The bridge spans approximately 65m across the river and is 8.5m above the water at the start/end of the track. The bridge is rated for ten people at one time. The Waikaremoana bridge collapse is reminiscent of the fatal Cave Creek Disaster, when a scenic viewing platform in the Paparoa National Park failed, resulting in the deaths of 14 people. The victims, 13 of whom were university students, fell 40 metres onto rocks below. The tragedy resulted in wide criticism of the government and its policies towards funding and management of the conservation estate. The Cave Creek viewing platform was erected by the state run Department of Conservation (DOC) in April 1994, and looked out over a 40-metre chasm with a view of where the creek emerges from a cave system below. The builders of the platform did not have appropriate qualifications for the job. Ten major problems or oversights occurred during the platform’s construction, including the wrong size of bolts being used. The platform was highly unsafe, especially with large numbers of people on it. Now we learn from DOC, via the NZ media, that the Waikaremoana bridge collapsed due to a cable “release“. Obviously cables no longer snap, rust through or otherwise fail in New Zealand – they “release” and cause people to “slip off” and fall 8 metres. Note: New Zealand’s Deputy Director General of Conservation is Mr Mike Slater. A cable on the Hopu Ruahine bridge on the Lake Waikaremoana Track “released” yesterday afternoon, about 1pm, Department of Conservation operations manager Mike Slater said. Robust and comprehensive. So why did the cable “release” and what does this mean for other bridges and platforms in the National Parks? Was the bridge, or any of DOC’s structures inspected after Cyclone Pam in March 2015? 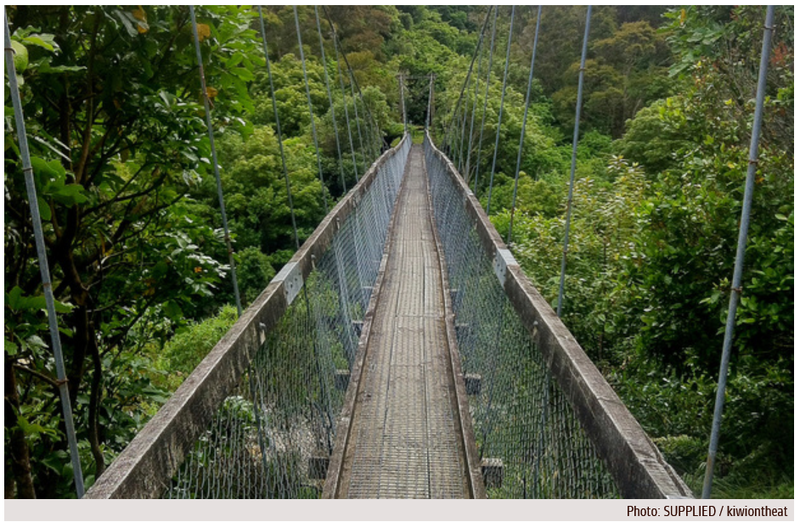 Mr Slater said there could be implications for other structures in national parks, but DoC would not be checking the safety of all 524 cable bridges throughout the country until this priority investigation was completed. “The cable failure is not only extremely concerning, it leaves New Zealand vulnerable to harmful tourism reaction. This must be sorted immediately. Chris Jordan also worked with other bereaved families to get New Zealand to adopt higher standards . Rescued campers ‘rather foolish’, say police (Sept 2015) – Despite not knowing what equipment the hikers had, their level of experience, or their understanding of English, the two Latvian tourists were branded ‘foolish; for setting off after adverse weather conditions had been forecast in the Nelson Lakes National Park.